The danish artist carl henning pedersen was born 1913 in copenhagen. He started as self-taught painter till 1933 when he learned from the art teacher Else Alfelt, who later became his wife. At this time he also produced his first abstract paintings with flat planes of colour, from which he got inspired by works of cubists, Paul Klee and Joan Miró. He first exhibited 1936 in copenhagen. 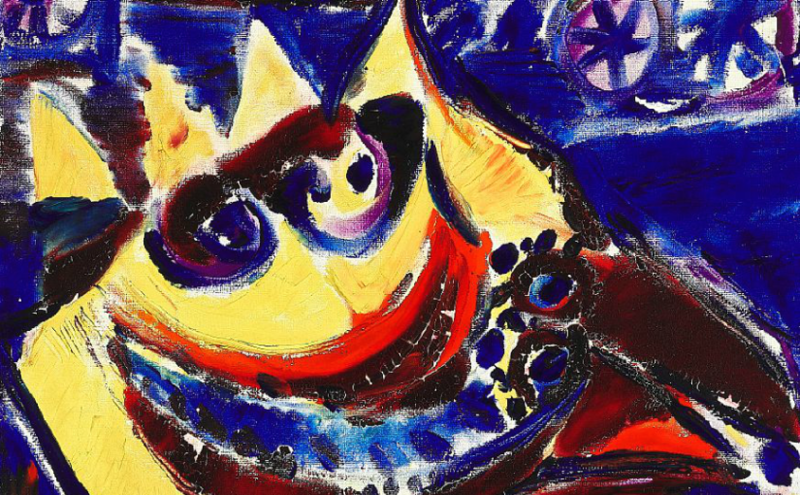 In 1939 he traveled to paris where he saw works by Picasso and Matisse and on the way back, by passing by Frankfurt he saw works of Chagall which remained a strong influence on his art for the rest of his life. In 1940 during the Nazi occupation of Denmark pedersen worte along Ejler Bille, Egill Jacobsen, Asger Jorn and others for the art journal (underground art group) Helhesten (hell-horse). In 1948 was Pedersen one of the founder of the art movement CoBrA. In 1976 opened in henning the Carl-Henning Pedersen and Else Alfelt Museum, to which Pedersen donated many works. Carl-Henning Pedersen died 2007 in Frederiksberg.